For more than 150 years, Hungary has had a high quality and innovative ceramics factory, the Zsolnay Manufactory of Pécs in southwest Hungary. Founded in 1853, the factory has made significant contributions to the country's artistic and economic well being. Founded by Miklos Zsolnay and operated by his family for decades, Zsolnay has from the beginning shared in Hungary's political ups and downs. Starting out as a small factory making stoneware and earthenware, the Zsolnay Manufactory gradually brached out into art pottery, architectural ceramics, industrial goods, and other fields. It became known for its technological prowess, inventing special types of clay like porcelain faience, glazes like its eosin metallic luster, ornamentation techniques, and a ceramic material called pyrogranite for architectural use which was impervious to weather and pollution. Miklos' oder son Ignac managed the factory from its inception in 1853 through 1865 at which time Vilmos Zsolnay, the younger son, took over and managed the operation until his death in 1900. By the 1870s, Zsolnay's art division was making ornate decorative objects, blending historical motifs along with those of nature and peasant art. While the company won recognition at the Universal Exhibition in Vienna in 1874 and elsewhere, the great days of the factory's art pottery production came at the turn of the 20th century when the Austro-Hungarian Empire was still intact. Zsolnay, affected by international trends, shifted from its traditional native and historical designs to the new Art Nouveau style in about 1897 and achieving worldwide acclaim. 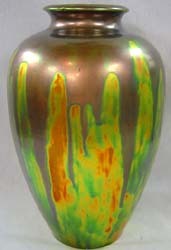 Many Zsolnay vases made during this period incorporated an hourglass curve that suggested the female form and bulged somewhat at the bottom. Highly prized among collectors is the red iridescent glaze developed by chemist Vinsce Wartha (1844-1914) and the gold lustre for which the factory was well known. After the end of World War I, the Austro-Hungarian Empire was in ruins and the factory lost its access to raw materials and external markets. During the period after World War II, the company's artistic expression suffered under the Communist regime and the Zsolnay family- seen as catering to bourgeois tastes, was ousted and persecuted. The plant was renamed the Pecs Porcelain Factory and became part of a state conglomerate turning out industrial products. By the 1950s, the Communist control began to loosen and Zsolnay regained its artistic creativity. Designer Victor Vasarely returned from Paris and made a sculpture from Zsolnay tiles in 1974. In 1983, Eva Zeisel visited her homeland and worked for a time at the factory designing vases, candleholders, and other containers using the eosin glaze. Many Zsolnay tiles and architectural elements survived the war in Budapest and elsewhere, and the examples at the Hungarian National Academy of Music and Dramatic Arts (1904-1907) and the exquisitely tiled dome, roofs, facades, and interiors of the Museum of Applied Arts (1893) are among the best. The factory continues in operation today largely still under state ownership and has established an art pottery studio to produce limited edition objects and architectural ceramics for contemporary buildings. Buy period Zsolnay, Teplitz Amphora, Tiffany, Rookwood, Clarice Cliff, Moorcroft, and other finer art pottery & ceramics on the Collectics Fine Antiques and Pottery pages, or search the entire site for great antiques, collectibles, and crafts for every collector!